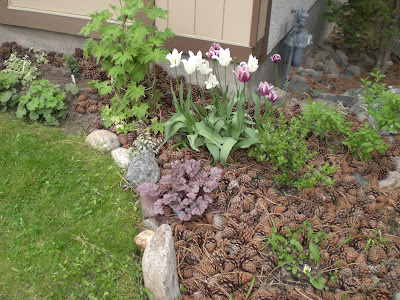 An outdoor organic garden located in Merritt, Canada, Flora's Front by the Lawn garden currently contains 3 plants. 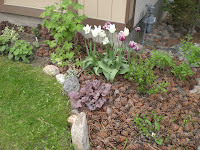 This is a Foundation garden that is known to be in USDA Hardiness Zone 5a. It has mainly Clay soil and receives Partial Sun light. I just noticed your comment Hedge…I’ve been out in the garden too much I suppose :-). Yep, those are pine cones for mulch. I have 2 great big lodge pole pines and all my neighbours have at least that many so whatever way I can use the silly cones is positive. They are good in established shrub beds and okay for perennials but not much use elsewhere.